Create Embellish Adore: On the wild side!!! Summer of 2008.... Cousin's baby shower.... what to do, what to do???... one idea another, the shower gets postponed... she is taken to the hospital.... days go by... she is going to have this baby weeks before due date.... original shower time has now past, and we wait to hear again, when it would be held.... I know that she is anticipating a boy, and she is registered with the jungle theme... HOORAY.. I can try out the SUP Wild... something stamp set! I know that I will have another mass production so I only do Thank you cards, but in the middle of the thank you card idea, I decide on a door hanger... I wanted to do some stamping on a few bibs or onesies, but I had a time issue at hand... oh well, next time. Very cute baby ensemble...thanks for adding me as a friend on Papercraft Planet. I can't keep up with all of these MB'S- LOL *wink*. 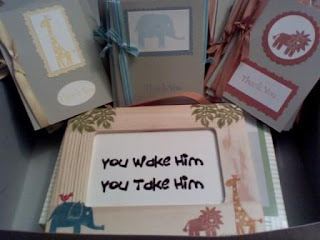 Will have to case your jungle frame...I have similar set by MFT and can't wait to use it. 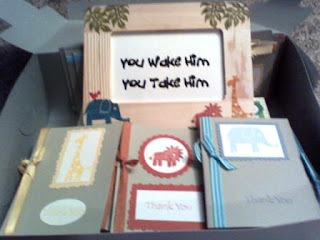 I love the cards and the door Hanger. I may have to case it and make one for a friend (use to babysit her. She too had her baby early 2 days before her shower, so she missed the shower. 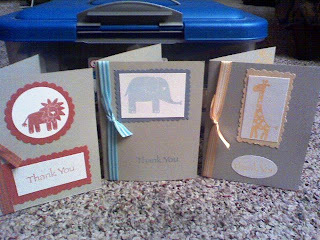 I am making her Thank you card as well, she picked the "She's All That" stamp of the pregnant girl. I have given her 30 so far, only 70 more to go. Ugh!Why did I have to decide to emboss them. I will try to remember to take a copy of one from my next batch and post it.